It is perfect for presenting cakes, minicakes, biscuits, bread, cream slices, muffins, cookies or special occasions for desserts such as weddings, baby baptism and birthday parties. The night before, please put the cupcakes in the cup. The cupcake keeps fresh. It has a dome cover for the protection of fine ice and decoration, which can be firmly fixed when closed and can be re-sealed after opening. Decrypted crystal clear cups with improved product visibility will provide impulsive sales for all your bakery cake muffins. Your customers. Friends, students, kids, would like the appearance of your cupcakes in the container! Size: Bottom Diameter 3 ", High; 1.6". Beautiful appearance, waterproof, to prevent the cake deformation, easy to carry or send. 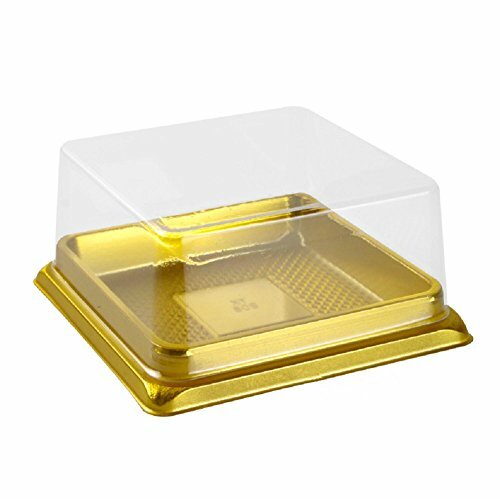 It is perfect for presenting cakes, minicakes, biscuits, bread, cream slices, muffins, cookies or special occasions for dessert boxes such as weddings, baby baptism and birthday parties.